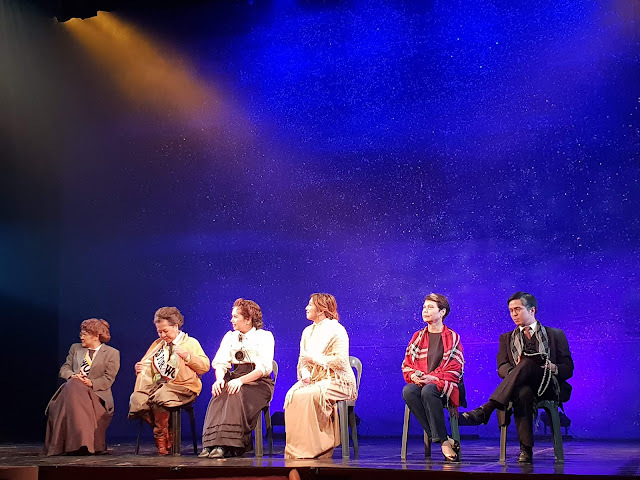 Repertory Philippines’ production of “Silent Sky” premiered last March at the Onstage Theater in celebration of International Women’s Day. 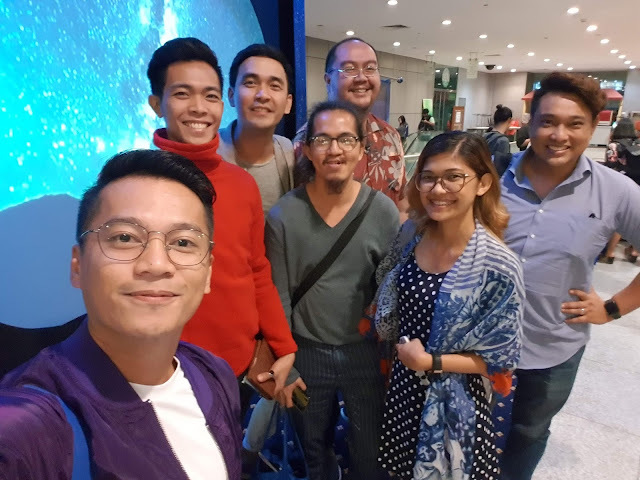 You know that you're in for an awesome show when Ms. Joy Virata is directing the powerhouse cast lead by Cathy Azanza-Dy together with Caisa Borromeo, Naths Everett, Topper Fabregas and Bibeth Orteza. The latter is making her much-awaited return to the Philippine stage playing the role of the brilliant astronomer Annie Cannon. Playwright Lauren Gunderson lifts from the pages of science history to bring to the stage the story of Henrietta Leavitt, one of the greatest minds in the world astronomy, who remains as unrecognized today as she was in her own time, a century ago. Leavitt was among the Harvard Computers: women hired by the Harvard Observatory in the early 1900’s to painstakingly analyze and catalogue every observable star in the heavens. She, along with Annie Cannon and Williamina Fleming, were among the first women to blaze a trail for themselves in the heavily male-dominated science of astronomy. Cathy Azanza-Dy made a very believable portrayal of Henrietta. When she was asked how she prepared for the role, she said that she can't stop "geeking' out after learning some astronomical words and how calculations were really done before. This helped her better understand the context of each of her lines. We got goosies from Caisa Borromeo as she plays Henrietta's loving sister. Her voice was very angelic. We love the heavy confrontation scene between the sisters. It was intense! We're not sure when was the last time we saw Topper Fabregas played a role that made us giggled out of 'kilig'. As Ms. Bibeth Orteza mentioned during the QnA, if she's not married to her husband, she's probably ending up with Topper. Naths Everett portrayal of her character with Scottish accent was flawless. We've scene her in a lot of performances before and she always make it a point to deliver an on point characterization. How I wish more young theater artists can watch how she delivers every performance and even immersed themselves on her creative process. #SilentSkyMNL receives standing ovation from the media and theater enthusiasts during the special Preview Night. A lot of people have also been admiring the backdrop of #SilentSkyMNL and are asking how it was done. Well, there was nothing hi-tech about it. 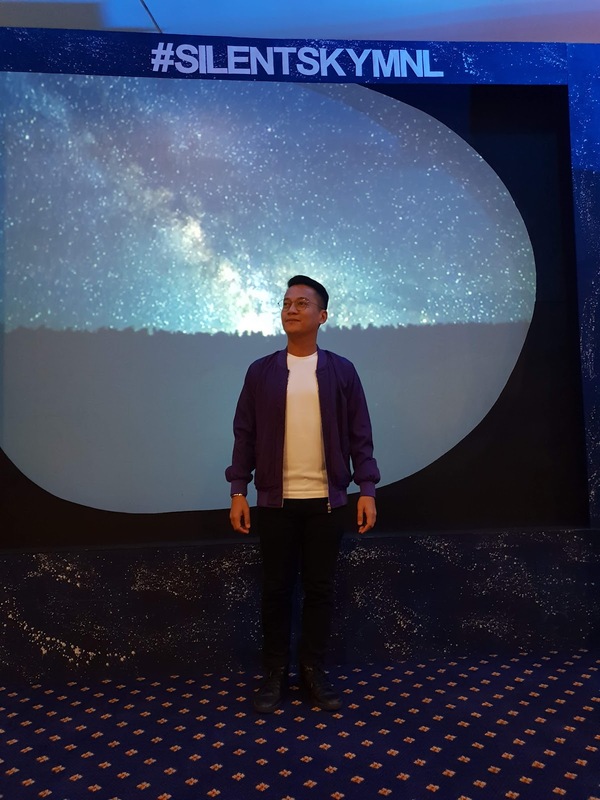 Backdrop was designed by Joey González-Mendoza and executed by our scenic painter Adul Lasin. Christmas lights were strategically-placed behind the backdrop by Pabling Salvador. Then came John Batalla's lighting design, executed by Mark Daniel Dalacat for this RCBC run. Add to that the music of Jethro Joaquin to set the mood for the "changing galaxy". And take note. RCBC doesn't have the lights Rep had for the run last year and John didn't want me to add anymore. "Too expensive!" We'll just make it work with what we have! ", he said. (Bless him!) Award-winning LD ka naman, I know you'll make it work!, I said. So there. No computers. No videos. Just a collective effort of really really really very very talented people! Special thanks to Ms. Ria for the invite. Again, congratulations! 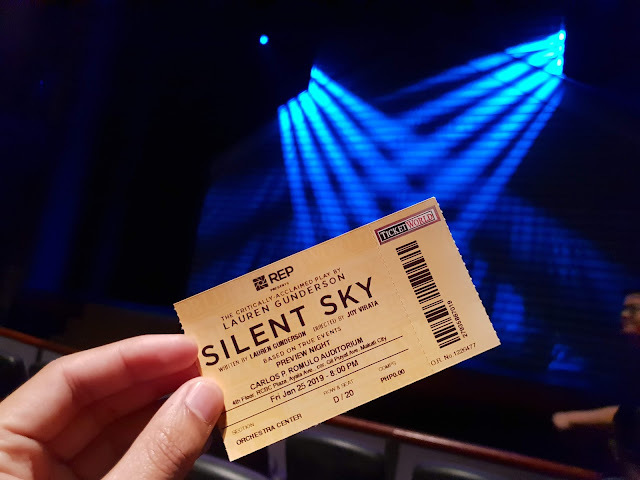 If you are in for a treat, #SilentSkyMNL will play at the Carlos P. Romulo Auditorium at RCBC Plaza for two weekends from February 1 to 10, 2019. Fridays and Saturdays at 8pm with Saturday and Sunday matinees at 3:00pm. You may call Ticketworld at 8919999 to buy your tickets. You may email riapangprojects@gmail.com for block buying opportunities.